With the weather turning colder and the nights getting darker, Winter has well and truly arrived. So to welcome the new season, we have come up with a few top winter activities to keep all children entertained. Have a go at making some winter treats with your children or charges. Encourage children to get creative in the kitchen learning new recipes and baking skills. If you are looking for a fun filled activity to take your children or charges to, then ice skating is perfect. A top winter time activity that older children can enjoy. Please be aware that it is not advisable to take younger children ice skating. With the British weather as unpredictable as it is, we never know what weather we will get next. If snow falls this Winter, have fun playing around, building snowmen, making snow angels, sledging and having snow ball fights. Have a go at making your own winter/ Christmas decorations and hang them in your home/ bedroom. A simple craft activity that creates hours of fun! All you will need is lots of strips of wrapping paper and sticky tape. You will need to make your piece of paper square. To do this, take one of the top corners and fold diagonally across the paper. 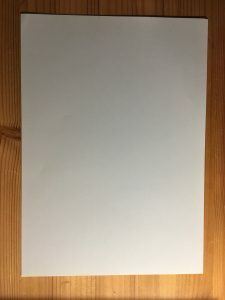 The bit of paper that is below, fold over and crease. This is the bit that you will need to ‘chop’. Cut across the fold that you have made. You should now have a square. Make sure it is in the right place before you crease the paper. Next, you will need to fold the triangle into thirds. With the top point of the triangle at the bottom, fold over side 1 (left side) and then repeat for side 2 (right side). Now chop off the bottom to make it straight. Now let your creative side come out. Cut out various triangles and shapes along the sides of your snowflake, making it as creative as you like. Once you have finish your design, unfold to reveal your creation. If you want to, have a go a decorating your snowflake with colour or even glitter! When finished, allow to dry if needed and hand up or display on a window.